Do you need to be Fritz to sac pieces? White to play...would you Bxh7+? ...I second guessed myself. What did I have to show? I can bail out and take his rook on f8 and maintain somewhat material equality, but I am left with such horrible pieces. With Game 45, I felt I was forced to play that so I could use the rest of my time to dig myself out of the hole I put myself in. After running this position thru Fritz, I found that Nxf8 is fourth best(?!) Fritz still gives me an advantage, but from a human standpoint, a very difficult game lies ahead. 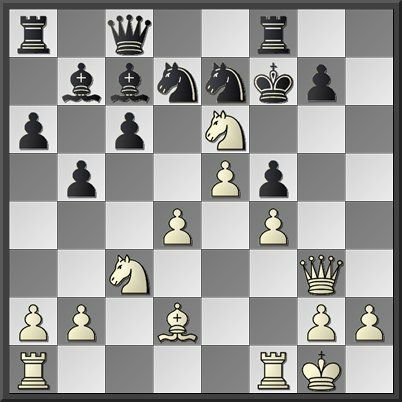 Two stronger moves are Nxc7 and Ng5+, both still with the similar dilemma. These moves pale in comparison to what Fritz suggests as a winning move. Sacrificing a piece for a positional edge with no immediate winning back of material is a difficult thing to swallow. What does Fritz do when he reaches this position? It's no surprise he chooses to sac yet another piece. Do you see it? The tragicomedy of World Championship qualifying still goes on this week with 4th leg of the FIDE 'Grand Prix' , to my count the 946th different way that our UFO-worshipping overlords at FIDE have tried to manufacture an alleged undisputed champion. As the GOAT himself found out when he lost his long-held title to Kramnik in 2000, there can be no logical way to determine a World Champion. Rather, the choice must have the flavor of politics (Veselin 'I am who am' Topalov) or utter randomness (Ponomariov, Kasimdzhanov, etc). The latest cycle is as noteable for the players who have dropped out in protest (Carlsen, Adams) as it is for those who never signed up in the first place (Kramnik, Morozevich, Topalov). The period in chess history after 1993 is perhaps comparable to the steroid era in baseball, where only in retrospect can we truly process the shame and denigration that has been heaped on the highest title in chess. The title doesn't have much worth now because there is no one player dominant enough to lay claim to best in the world for any extended period of time, but still we must hope chess does not go the way of boxing with multiple titles and general disinterest (well, except that it did). Our heroes are dead, all we control are the 64 squares before us; play well. One of the best free resources for chess improvement has got to be Dan Heisman's "Novice Nook" column at ChessCafe. 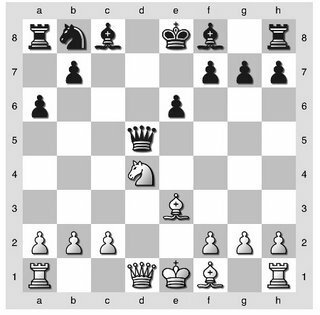 Dan is nearing his 100th article (which we should see next month), and you can access the first 99 via the ChessCafe archives. This month's article, "The Endgame Bind," offers the interesting position above, asking "How many plans are reasonable?" I found it most interesting that the least complicated plan -- and the one that human players will hit on pretty quickly (and masters will see in an instant) -- is not the one preferred by computers, since it requires too many ply to see to the end. 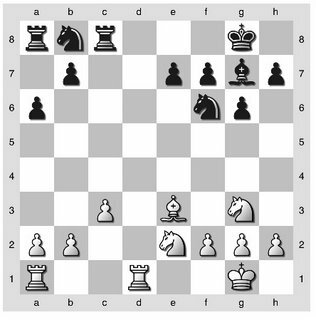 But humans can leap over the ply with various grouping techniques, such as the rule of being able to catch a pawn if you are "inside the square of the pawn." A fun puzzle for developing players, and another great article from Dan Heisman. Class B player Don Carrelli has made the excellent suggestion that we should create a library of used chess books at the Kenilworth Chess Club. I have a few books I intend to donate, and if anyone else has some books they can chip in, before long we'll have a formidable collection of also-ran books. If nothing else, I have a self-imposed rule about how many books I can own, so I have to get rid of some so I can waste money on others. John and Mike: is this an idea you want to spread? Hey you! Bring books! Donate! 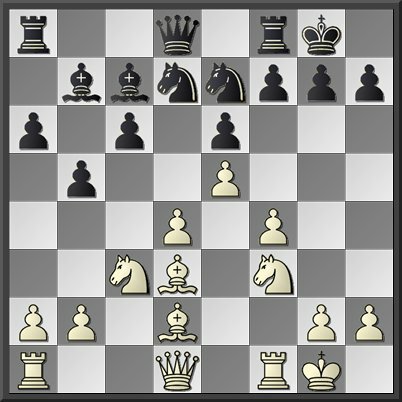 But for our purposes, let's look at the position at move 11 after a few dubious opening moves by Black. Here a number of people smarter than myself have suggested that White play 11. Bf3, or 12. Bf3 to crimp Black. 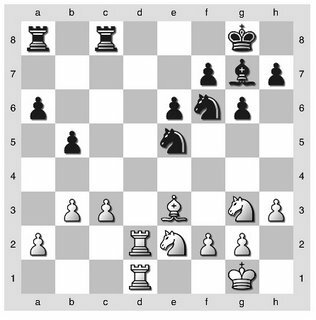 Black, on the other hand, is facing a mobile Q-side pawn majority and is underdeveloped. 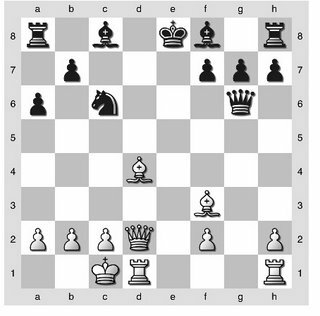 Compare the position after move 10 and after move 18, and you can see how the superior player can turn a position around quickly and quietly. Nimzovich was a positional mastermind, giving rise to the hypermodern school of chess theory that contends control of the center is more important than occupying it. In this way, one can use pieces rather than pawns to control key squares in the center (like e4 in the Nimzo/Queen's Indian). But his generalizations were also backed up by a sharp tactical mind. Let's look at this classic that demonstrates the latter point, Nimzovich-Alapin (Riga, 1913). 14. Bf6!! If you saw this coming you've either seen the game before, or you should say hi in the comments section, Mr. Kasparov! I've played games like this before, but only from the losing side. 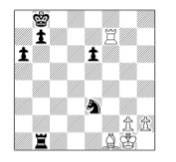 I have been looking at Raymond Keene's Nigel Short: World Chess Challenger (Holt 1992) and came upon the diagram above from Short - Miles, British Championship 1984. 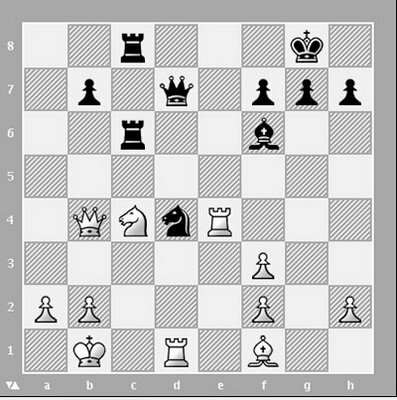 This fascinating position was given as a quiz back in 2005 at Chessgames.com (follow the link above for the game and the "answer") but it is worth trying to figure out on your own -- and worth noting that Short did not see the winning move (or else rejected it because Black's most challenging reply just looks too good). 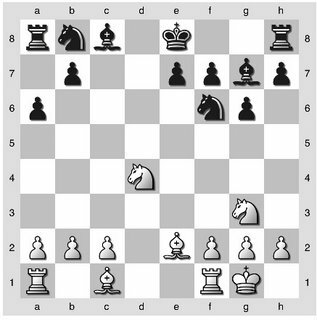 I think it's even worthwhile to take the hint that White's best is a Knight move that wins at least the Exchange and Black's most challenging response is a Knight move that threatens mate in two ways--but then White has a triple-exclam shot that wins anyway. An incredible series of moves once you see it. I am really enjoying Short's games, by the way, and recommend them to you. I think too many people think of Short as a World Championship "also-ran," but he created some real masterpieces, including two games I annotated as part of my consideration of the Mad Dog response to the Pirc and his "immortal King walk" in Short - Timman, Tilburg 1991. And he continues to play some great chess: witness Short - Kasimdzhanov, Wijk aan Zee 2009.